This book examines the extent of, and motives for, the diffusion of flexible automation (FA) at global level and then turns to the local and firm level, bringing together in-depth studies of sixty-two firms in Brazil, India, Mexico, Thailand, Turkey and Venezuela. Research focuses on the impact of computer-numerically-controlled machine tools on scale and scope by exploring changes in lot sizes and product variety (product scale and scope), total plant output (plant scale) and total firm output (firm scale). Barriers to setting up FA-based operations are discussed, as are factors which may affect a decision to locate in a developing country. The contributed studies reveal a relatively slow diffusion of FA in developing countries and it is demonstrated that while FA possibly increases scope, it also requires that plant output be increased in order to maintain efficiency. 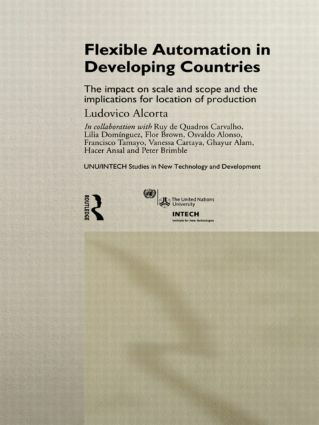 Alcorta concludes that the location in developing countries will probably only be viable for large domestic firms, multinationals seeking to relocate simple but labour intensive assembly processes and firms in countries with significant domestic markets. This work is unique in addressing the scale and scope issues in developing countries and in the wealth of information regarding machine tools which it provides. The data provided in the appendix includes official United Nations data, previously unpublished. This will be of use for all research into trends in the use of machine tools.